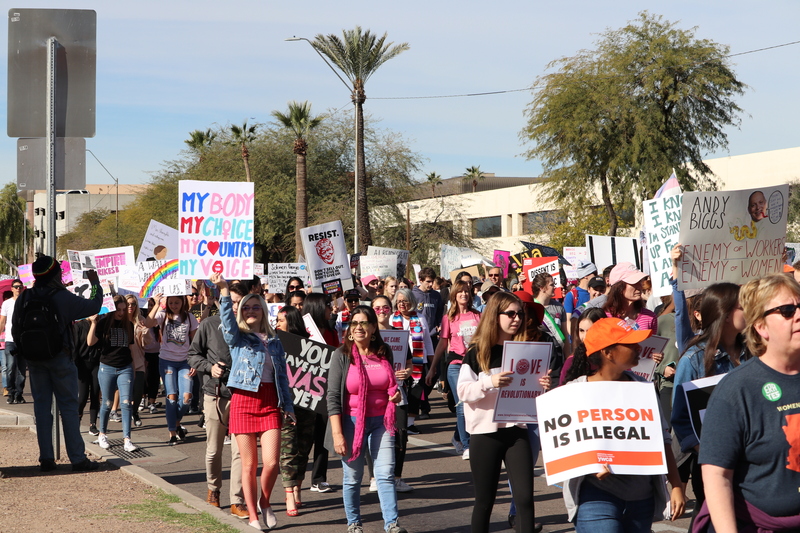 Several thousand women, men and children turned out Saturday in Phoenix for the Women’s March at the Arizona State Capitol. The event largely served as a rejection of President Donald Trump, a sentiment that led to the creation of the Women’s March nationally and internationally in 2017. But under this year’s theme of “Rising Together,” the Phoenix Women’s March was a also a space where different social issues and diverse movements were visible, among them the missing and murdered Indigenous women and girls, the recent death of 14-year-old Antonio Arce who was shot in the back while fleeing a Tempe police officer, gun violence prevention, funding public schools, accessibility for people with disabilities and reproductive health. The march was led by a group of Indigenous women and families. Tashina Atine, who is Diné, walked as she held up a red sign that read in black letters, “Protect our Indigenous women and children.” Atine lives in Phoenix and participated in the march to raise awareness on the indigenous women who are victims of crimes and are unaccounted for. An unofficial estimate set the attendance between 6,000 and 7,000. While was considerably less compared to the previous marches – about 20,000 people showed up in 2017 and 25,000 last year – several people said the turnout was still comforting. “I’m really happy that there are so many people that come out. I feel the sense of community,” said Temoria Mughal, 23, a graduate student at Arizona State University who marched wearing a hijab. When she moved to Phoenix from New York in August, Mughal said she was concerned about the Arizona being unwelcoming or hostile to her. Saturday’s march gave her a sense of solidarity, she said. For Casa Grande resident Latrice Cooper, the turnout was a sign of a common experience around inequality. Wendy Reyes of Chandler walked holdings hands with her two kids, Chloe, 9, and Levi, 6. Reyes said she was motivated to participate in the event because a record number of women are serving in the U.S. Congress. Her aunt, Esther Salcedo, walked next to Reyes. “There’s so many passionate people, it is motivating to see the unity among us all,” Salcedo said. During the event, a handful of Patriot Movement AZ members walked along the march carrying Trump and Make America Great Again flags. At the state Capitol, where the march ended, Patriot Movement AZ members Lesa Antone and Jennifer Harrison mocked and taunted Women’s March attendees on why they reject President Trump. Maria Flores stood nearby and watched. Flores said the group has the right to express what they think. “It’s important to know women are not submissive, we are here, we are taking space, we matter, we have love in our hearts,” Flores said. About an hour after the march finished, a group of girls and young and older woman began to dance next to a speaker playing pop music. Jaedyn Kelling, 22, held her “Future is Female” sign as she danced, while Dianne Basher shook her hips next to her. When the song ended, Basher did a spin and then landed in a full split, and the crowd around her cheered. “I love the energy here,” Basher said. Religion and/or the Bible can be used as a weapon in many cases. I grew up in Indianapolis and I am fully aware that Reverend Jim Jones, infamous for his Peoples Temple cult started in Indiana and had a church on the south side of Indianapolis. (Hoosiers are easily turned into sheep like followers) Many of the fools that drank Jim Jones’ Kool-Aid in Jonestown, Guyana were Jones’ easy to manipulated Hoosiers. Women are doing pretty awesome but I’m sure in backward states like Indiana, Arizona, Mississippi and other “Sh**hole” states south of the Mason–Dixon line Line it’s still a struggle. Keep up the up the good work ladies you have more than earned your spot in American Society.